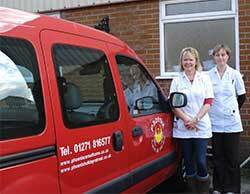 Our wheelchair access vehicle was purchased through fund raising and client donations. The vehicle is for the use of Phoenix clients and their families, to enable clients to go out, or to take clients to appointments etc. The vehicle is free to use but mileage is charged at 45 pence a mile, and if a carer was required the carers time would need to be charged.